This Q/A give an introduction to my work, and how it can help you in your gardening. How did you start gardening in the first place? I grew up on a farm and noticed how many synthetic chemicals were used to grow food. I determined to start a market garden for nutritious food, on a 6000m2/1.5 acre field at my family’s farm in Somerset, UK. I was a vegetarian and wanted to grow, eat and sell healthy food. Organic was at that time a revolutionary idea. I rotovated the soil to kill pasture, then made beds by hand, then realised after all that work that it would be a pity to rotovate again and flatten my lovely beds. I read Ruth Stout’s book (No Work Gardening) and decided to go no dig, as well as organic. Sometimes people want to start with a vegetable garden, but they do not have the experience. How to begin? Start small, even one bed of 1.2×2.4m can grow a lot of food. Cropping a small area well is more productive than having weeds and empty spaces on a larger area, and you will enjoy it more. For many people, gardening stops when winter comes. Do you have tips for gardening in the winter? Oh yes, keep sowing and planting in July, August and September to have harvests in autumn and winter. Plus winter is a time to prepare for spring, an opportunity to tidy beds, feed the soil, maintain edges and hedges and to be as prepared as possible for the new season. Success in gardening comes when you are anticipating and ready for upcoming growth, including weeds. No dig is key to having less weeds. What is your experience between growing vegetables in containers or in the open ground? With containers it’s easy to get started, once you have bought the compost. After that there is extra watering, compared to growing in soil, unless you invest in a good watering system. For containers I recommend growing leafy crops like salads and spinach. However if you have soil to grow in, I would concentrate on that above all. What is your opinion about the use of pesticides in the vegetable garden? It’s a horrible thing to use any poisons, because they cause harm to so many good things in the garden. Even artificial fertilisers (NPK) cause damage, for example to soil fungi. When you garden well, there is no need for synthetic inputs because your garden has a better balance of beneficial predator insects. And with healthy, no dig soil allied to sowing seeds at the most favourable time for each plant, you suffer less problems of disease. We notice a climate change: do you also notice this change and how do you deal with it? I have kept weather records since 1973 and there are changes in the overall pattern, though not many. For example over 40 years ago in 1975 and ’76 we suffered a remarkable drought and heatwave, before climate change was being linked to weather extremes. However now I do notice more extremes, and a slightly longer growing season, but still with the same parameters here of unchanged last and first frost dates. So I garden in the same way, and accept that harvests vary a little more. Coping with extreme weather is easier with no dig because of better moisture conservation, better soil drainage, and being able to garden in all weathers, even in rain and on clay soil. So it’s the way to go for climate change. How big is your own vegetable garden and how much time do you need to maintain it? My cropping area, beds and paths is just under 1000m2, plus there are flower borders, lawns and fruit trees on another 2000m2. In 2018 between April and November I gardened for an average of 35 hours per week, and I employed helpers for a similar amount, so it was about 70 hours per week altogether. Much of that time was spent picking vegetables. In 2019 the time balance may shift between what I can do, and my helpers. As we can see in your videos, you have a rich harvest every year. What do you do with all that harvest? I sell bags of mixed salad leaves all year except in midwinter, mostly to shops and restaurants in the local town of Bruton, 6km away. Plus I sell some vegetables and sales are over £20,000 most years. As well as that, there are harvests of lovely produce for all the courses we run here, with their lunches created by Stephanie Hafferty. Here in Europe we notice that vegetable gardening has become enormously popular. Can you explain this advance? I am so excited about this and it’s the same in the UK. 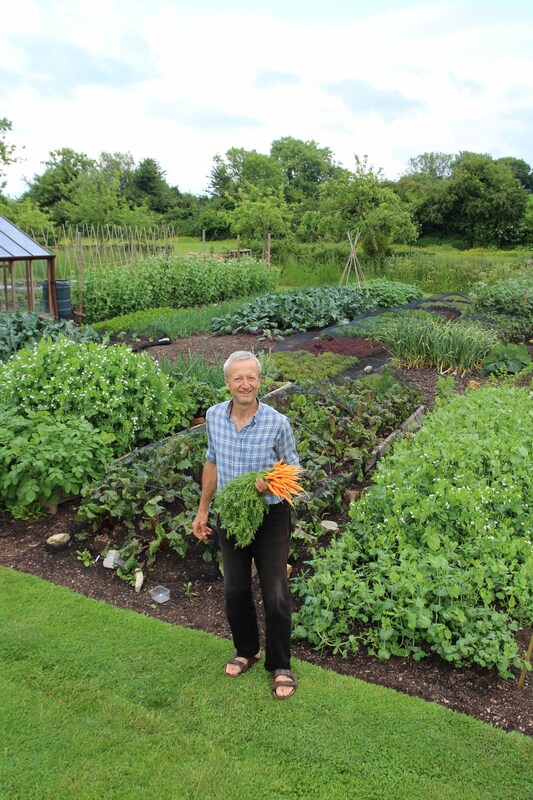 There are many reasons such as a desire for health, and a realisation of the fulfilment gained by growing your own food. Better health comes from many parts of growing your own food: the exercise, being outside and eating lovely dishes. Nutrition research is helping too because of new realisations about the importance of microbes, and how it’s better for us to eat a carrot with healthy soil on, than a super clean one. Can you give an ultimate gardening tip?